–	What do you think was going through the minds of the servants as the collected the water? –	Was the wine Jesus made good? –	Why do you think Jesus told his mother, “My time has not yet come.”? –	Taste Test Time! Gather three liquids that you drink. Please don’t get anything gross. I mean, I guess if you have a household of preteen boys, sure, that might work. You’ll also need a blindfold! Each person takes turns blindfolded and tasting the three drinks and guessing what is in the cup. Could the guests have mistaken water for wine? If you want to make it easy for younger kids, choose drinks that are more different- water, juice, milk. If you want it to be more difficult, choose similar drinks- orange juice, mango juice, grapefruit juice or Pepsi, Coke, RC Cola or cow milk, almond milk, coconut milk. Parents- participate! It is fun for kids to watch parents play, too. –	In Hebrew culture, lepers were considered unclean. It was part of the ceremonial law that Jewish people could not touch lepers. It kept them from spreading disease. Yet, here, we seek Jesus reaching out his hand and touching the unclean. Discuss the significance of that act. –	Let’s Put On a Play! Cast the rolls in the story. Jesus, Leper, Priest. Act out the story. With younger kids, you may need to narrate as they act. –	What do you think the paralytic man felt when Jesus said, “Your sins are forgiven.”? –	Why would that statement anger the church leaders? –	Which is easier, healing us of our bent nature or healing our bodies? –	Talk about the role of the paralytic man’s friends. Would the man have the ability to even get to Jesus without these people? –	Story Time Yoga: We’re just going to move our bodies with the story. Participate or just read and instruct. Start lying flat on your back, arms and legs extended. You’re a paralytic. Your friends are lowering you down to Jesus. Reach both arms and legs straight up. Flail them around like you’re falling, if you wish. You’re on the floor in front of Jesus. Lay flat on your back, arms and legs extended. Put your hands in prayer position as you hope Jesus heals you. Jesus says, “You’re sins are forgiven!” Touch your heart, clap your hands, shout “Yay!” But you’re still lying flat on your back. Return your hands to prayer position. Jesus says to you, “Rise…” you stand up in your spot. Jump up and down and glorify God! –	Have you ever thought about the laws concerning the Sabbath and how we can honor them in a modern context? –	Why do you think none of the church leaders spoke up before Jesus healed the man? –	Why would the church leaders want to destroy Jesus? –	Pharisee May I? Game: This is similar to Mother May I, but a little different. One person is the Pharisee. Everyone tries to get from the start line, to the finish line, where the Pharisee is. They ask a question, “Pharisee May I take 4 steps toward you?” If the Pharisee answers, no one moves. If the Pharisee says nothing, take the steps. If you forget to ask the Pharisee before moving, go back to the beginning. Encourage the Pharisee to sometimes answer and sometimes not answer. –	What other paradoxes do we find in Scripture? –	Does this make Christianity untrue? –	Which line from the Beatitudes spoke to you most? –	Word Art: Make word art for the word Blessed. You can write it in rocks outside. You can make the word from a pile of laundry. You can write it on a piece of paper. You can make the word out of Legos. Bonus: If you can combine paradox in the art, like writing “blessed” in a mess your kids made or making it out of dirty dishes. –	Are you a city on a hill in your community? –	Is showing your light the same as bragging about your good deeds? –	Salt and Light Painting: You’ll need white school glue, black construction paper, salt, and watercolor paints. With the glue, make a simple drawing that represents light. It can be a lightbulb, a candle, a flame, a fire, a window, the sun- whatever light object of the child’s choice. Once you have your object drawn in glue (if you want, you can chalk draw it on the paper and then trace over it with the glue), sprinkle salt over the entire thing. Pour off excess salt. Wait a couple minutes for this to dry. Don’t want to paint in wet glue. Once it is dry, take watercolor paints. Wet your brush, mix your color, and simply touch the brush to the salt. The salt will soak up the color from the brush. 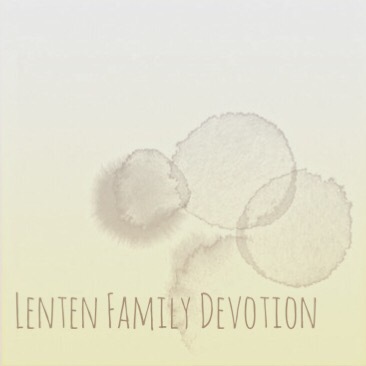 Once your art is complete, allow it to dry and display it with your Lenten artwork.